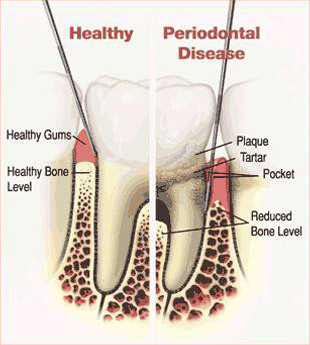 Periodontal disease refers to any kind of gum disease. A large number of people suffer from this problem. Periodontal diseases may or may not be very serious. Some of these diseases only cause a slight inflammation in the gum. In some cases, such diseases may affect the bone and soft tissues which hold the teeth in a very bad way. There may be a few conditions in which teeth needs to be pulled out due to a gum disease. Gum disease put a risk to the oral health. It is very important to maintain oral hygiene for preventing periodontal disease. If you are wondering about the causes of periodontal diseases then you need to know about the presence of bacteria in our mouth. Different kinds of bacteria are present in our mouth. When such bacteria teams up with mucus, they develop plaque on the teeth. Plaque refers to a kind of yellow white colored sticky material. When we brush our teeth then it gets removed. However, if teeth are not brushed and flossed properly, plaque may change in to tartar, which cannot be cleaned even by brushing. It enters the base of the teeth and causes gum diseases. 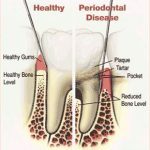 Here are a few symptoms which help people and dentists to find out a periodontal disease. Swelling in the gums or bleeding in them may be an indicator of gum disease. Bad breath also indicates gum disease. If teeth feel very sensitive to heat or cold then it may be due to periodontal disease. Loosened teeth and feeling of pain while eating food are two other symptoms of gum disease. The main purpose of dentists while treating a periodontal disease is to remove the infection from the mouth. Different procedures are used for the removal of infection from the mouth. Deep cleaning is done by dentists for curing such infection. Root planning and scaling are a part of deep cleaning. In sever type of gum diseases, flap surgery or tissue and bone drafts surgery may also be required. It is also very important to maintain oral hygiene once treatment is done by the dentist. Uh-oh, I only knew recently that I have a gum disease. I have the symptoms you mention here and even my mom would tell me that I have a not-so-good breath. My breath improves when I used a aloe vera and bee propolis herbal toothpaste which I bring everywhere I go. Great posts you’ve got here, thanks for the big help. This is a very informative blog post. Prevention is always the best medicine, and I think you hammered that point home very well. Preventing periodontal disease comes down to two factors: Keeping the mouth free of bacteria and controlling inflammation. To keep the mouth free of bacteria, brush and floss regularly. A good mouthwash helps as well. To control inflammation, eat anti-inflammatory foods such as apple cider vinegar, garlic, and turmeric. Taking low-dose aspirin may also be helpful. Regular exercise helps the mouth chemistry too. Thank you again for this informative post. I hope I was able to add something. Periodontal diseases may or may not be very serious. Some of these diseases only cause a slight inflammation in the gum. In some cases, such diseases may affect the bone and soft tissues which hold the teeth in a very bad way. There may be a few conditions in which teeth needs to be pulled out due to a gum disease.